Learning numbers is more than just counting. 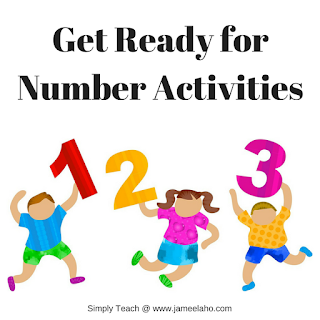 By the end of the first school year, not only do children need to be able to count but to also recognise numbers, count each item and write the numbers. Each of these requires a different set of skills. To prepare your child and give him an advantage, you can start teaching him these concepts in a fun and playful way. To say numbers in sequence is to rote count. 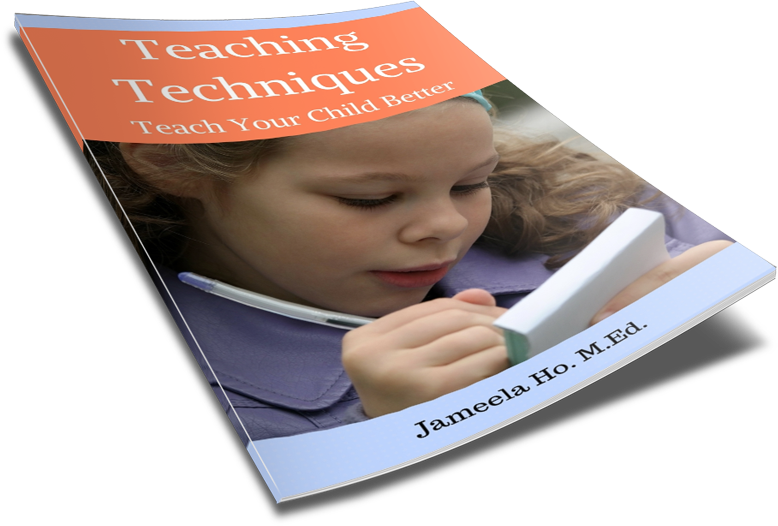 Most children can do this easily through listening repeatedly to others doing it. It is mainly learnt through memorisation. This is the most basic form of number knowledge and it doesn’t mean that your child will have an understanding of these numbers. But to be able to do this will help your child later with counting with 1 to 1 correspondence. The easiest way to teach this is through counting rhymes such as “1, 2, 3, 4, 5, Once I Caught a Fish Alive” and “Ten Little Fingers”. You can also clap each number as you say it with your child. Children like movement so think of other different movements your child can do with each number such as jump, stomp and slap knees. Children also like to use a novelty pointer stick to point to the numbers on a number chart as they say each number in sequence. At this early stage, most children won’t recognise the numbers so they’ll randomly point to any but once they recognise the numbers they will do so. Recognising numbers from one to ten depends on visual memory. Children have to remember to associate a symbol with its sound. At this stage some children won’t have a sense of number. They’re just learning to associate by memory. It’s not until they manipulate and play with amounts that they begin to understand what each number means. 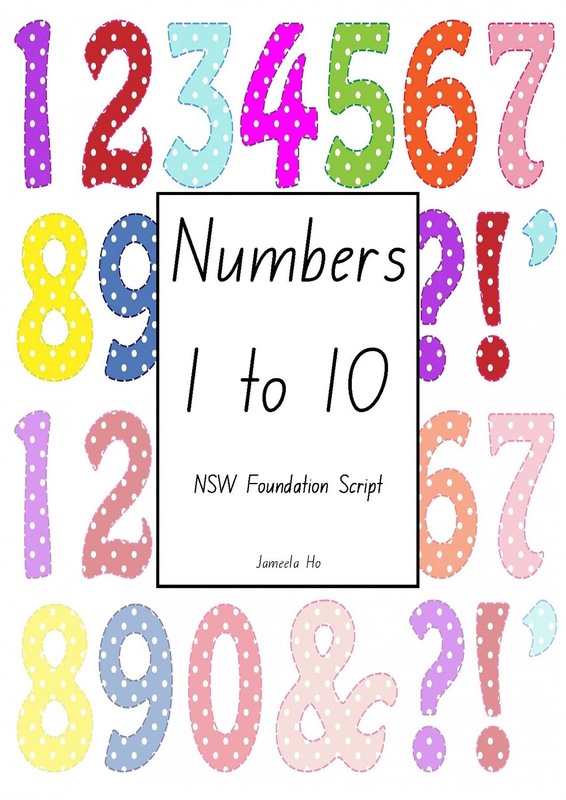 Use flashcards to help your child learn to recognise numbers. Do one number at a time. Play games with the flashcards. You can get two sets and play snap or concentration. When your child has found a match ask what number it is. Wooden peg puzzles are great for recognising numbers as it forces your child to look at the shapes of each number. But remember to say what each number is as your child slots it into place. Your child needs to hear the sound that goes with the number. Do a number search everywhere that you go: when you’re walking down the street, look at the house numbers and when you’re reading a book, look at the page numbers. Other activities are to play with play dough numbers, paint with number sponges and make a collage using number stickers. Subitising is when children can instantly recognise a group of items without counting such as the dots on a dice or domino. It helps your child to have a sense of numbers and later on, other mathematical skills. The way to learn subitising is through daily encounters with groups. First start with small groups of less than five then build their way up to ten. I teach children to recognise finger patterns as they learn to recognise the numbers. So when they are learning the number one, they also learn the one finger pattern (which is the index finger not the thumb) and when they learn the number two they learn the two finger pattern (which is the index finger and the middle finger) and so on. What you’ll find is that one to five is easier to immediately recognise than six to nine (ten is also easy because it’s just two hands). As a side note, when your child can recognise the finger pattern for seven, as an example, (which is five fingers on one hand and two fingers on the other) he’ll realise that seven is five and two. You can see how this is helpful to his understanding of addition, ten facts and subtraction (he’ll see that 3 more fingers are needed to make ten). Another activity to teach subitising is to use the dice and dominoes to play games. You can also use blocks and the abacas to make groupings. Counting with one to one correspondence is to match one counting number with one item in a group as you count. It is when you assign a number to an item as you say the number sequence. If your child randomly points to the items without synchronising it with saying a number then he has not learnt to count with one to one correspondence. The only way to learn this is to have lots of practice. Your child needs to slow down his counting to match and point or touch each item as he says a number in the sequence. The common mistake is when children point to the first item and their finger hasn’t moved off the first item but they’ve already counted up to three. Have your child count different things such as people, cars, toys, books, spoons and shoes. Use blocks, beads, the abacas and counters to count more. Read what children need to be able to count one-on-one. Writing numbers is a skill that develops with fine motor control and the ability to grasp the pencil with a pincer grip. It also relies on memory of what the number looks like and the way it is formed. Start first by tracing numbers to help your child develop control of the pencil. Once your child can do this then show him how the numbers are formed. Do them one at a time so as not to confuse him. The numbers one, four, seven, eight, nine and ten are easiest to write because they contain only lines and/or circles. Whereas the numbers two, three, five and six are harder for children because semi-circles that goes in one direction and change seem to be more difficult to draw. Provide different tools for your child to use and write on. Tools such as pencils, markers, glitter and gel pens, chalks, paints and crayons make mark making exciting. Different coloured and textured papers, whiteboard, pavement and books will give your child variety and make it fun to write on. As with all the skills listed here, the more your child practices writing numbers the better he’ll be at it. 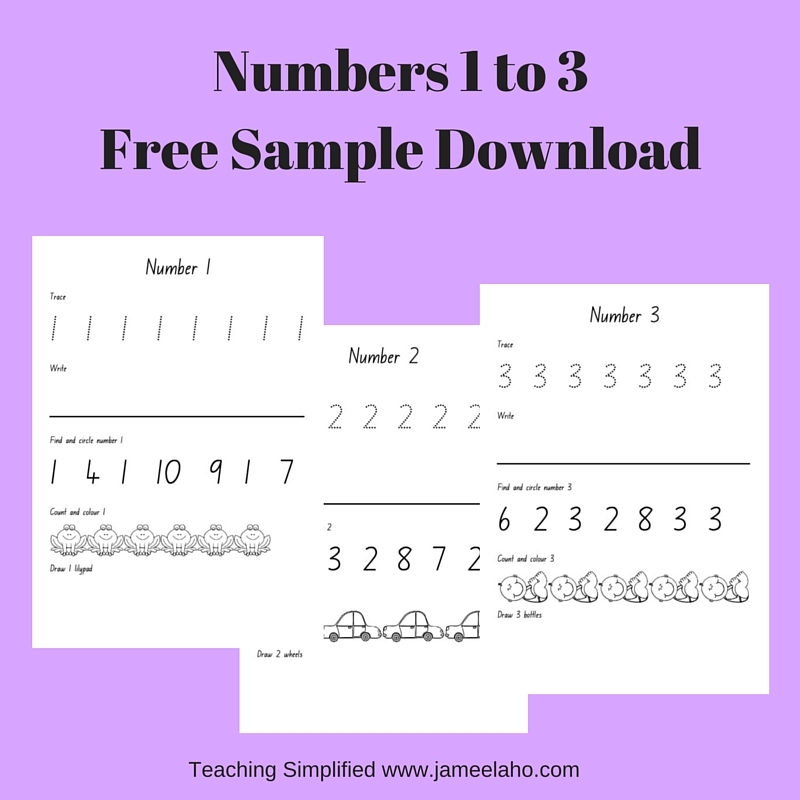 Download these free writing practice worksheets for numbers 1 to 10. Read Learning Numbers and Math Manipulatives for Young Children. 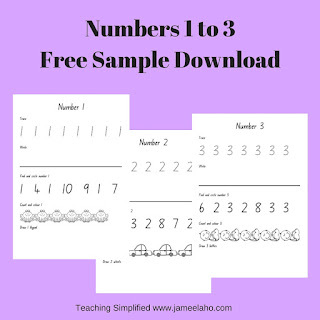 Download a free sample maths lesson. 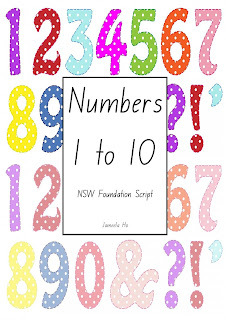 To help with recognising numbers and counting 1 to 3, download some sample worksheets or get the full book.